I’m determined to find a pineapple smoothie that can be my new “go to” breakfast drink. I tried out another recipe this morning and so far it’s ranked number one. I liked it more than the first, but I’ll continue to try out a few more. Dump the ingredients in a blender. Mix well and serve. 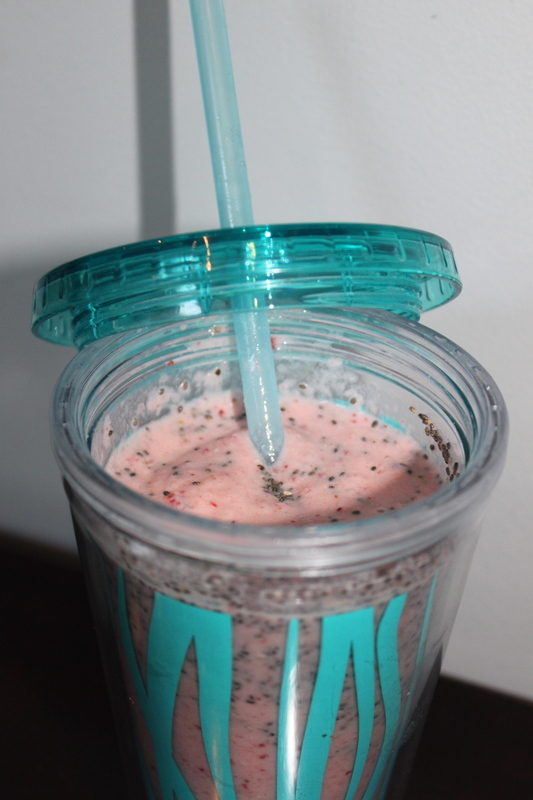 The coconut milk and chia seeds add some protein to the shake. I really enjoyed this smoothie. It was lighter than the first recipe which included both banana and yogurt. I think I’ll continue to play with a few more recipes, as I feel like I still need more protein. Although I enjoyed this version more than the first, I was quite hungry by mid morning. An egg has 6 grams of protein and my favourite breakfasts are usually 2 poached eggs on one slice of whole wheat bread (about 15 to 16 grams of protein) or a 3 egg omelette (18 grams of protein). I find that a high protein breakfast really sets me up for the day and I’m definitely missing this in my shake. I know I could throw some protein powder in, but my preference is to try and get the protein more naturally. When writing this post, I actually pondered the idea of tossing a raw egg or two in my shake just to boost the protein. I thought I’d look into it a bit and found this great article on Mark’s Daily Apple that suggests the protein in eggs is actually more digestible when the eggs are heated. The thought of raw eggs doesn’t really turn my crank, so I think I will continue to look for other sources and stick with cooking my eggs. I love peanut butter and would even consider eating a Tablespoon of it along side my smoothie to knock my breakfast protein up by 4 grams. My daughter often adds peanut butter to her smoothies, but I only like peanut butter combined with certain fruits. A chocolate peanut butter smoothie sounds wonderful, but it also sounds more like dessert than a healthy breakfast shake. I’ll keep you posted as I continue to test out more recipes.